Mildew And Moss Treatment: all mildew and moss will be treated with a Mildex solution. Power Washing: all surfaces will be cleaned from top to bottom, removing all mildew, moss, dirt, cobwebs, and debris. Scrap And Sand Loose Paint: all loose paint will be removed by scraping off and sanding edges for a smooth surface. Prime Necessary Areas: all new wood, bare wood, rust, metal gutters, rusty nails, and stains bleeding through surfaces. Patch Cracks In Wood Surfaces: all cracks in facia boards, trim boards, and siding are properly patched and sealed. Patch Cracks In Stucco: all cracks in stucco will be patched with elastomeric stucco patch. All stucco patches will be blended and feathered into existing stucco pattern. Caulk Around Window And Door Frames: all window and door frames are caulked thoroughly to help insulate windows and doors on your home, which also enhances the appearance. Reset Loose Nails: all loose nails will be reset to surface. Patch Leaky Gutters And Downspouts: all leaky seams in gutters and downspouts are properly patched and sealed. Minor Wood Repairs: remove and replace all rotten trim that surface preparation alone cannot repair. Any wood replacement will be noted in contract. Remove light fixtures and house numbers - Replace with old or new. 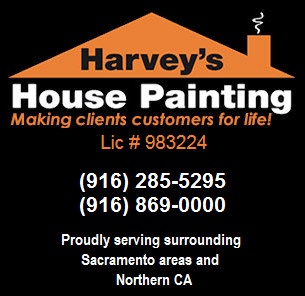 If you have any questions or we can assist you in any way, please contact Harvey's House Painting at 916-285-5295.